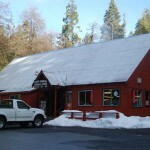 The concept is easy: there is only one city in all of Calaveras County and that’s Angels Camp. Everywhere else is considered unincorporated areas of the county. The Calaveras County government center is located in San Andreas, so everything besides Angels Camp is simply towns without borders, or in the case of Camp Connell and Dorrington, nice wide spots in the highway alongside the Big Trees Village subdivision. 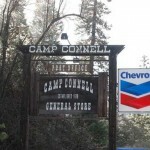 Camp Connell in practice is the Camp Connell store, gas station, and post office. Their real claim to fame is the authentic general store, and owners Tom and Donna Manning run a down-home operation that includes “Tommy’s Backyard”, where you can attend summer music events that take place each Saturday on the party patio. CCR Insider: Tommy’s Backyard is a very cool way to spend a warm summer Saturday night. Don’t worry about any “tourist versus local” mentality in our county. We all started as tourists and share the same attraction to these wonderful spots along Ebbetts Pass National Scenic Byway. Visit scenic4.org and see you at Tommy’s!